The course introduces the Tibetan Buddhist meditation practice “The Mandala of the Five Dakinis” according to Lama Tsültrim Allione, with the recited and guided version, and conveys the meaning of the Dakini from a female perspective. 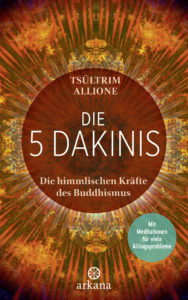 Deepening the practice of the five dakinis. The course takes place in a relaxed silence with exchange and playful exercises in the group and in pairs, inside and outside, with meditation in silence and in movement. Dakini means female Buddhahood in Tibetan Buddhism. The Dakini preserves and conveys the enlightened wisdom based on female life experience. I need a parking space in the valley (CHF 5.00 per day). I need a parking space near the hotel (CHF 8.00 per day). By submitting this registration form, I agree to support the house team about one hour a day by karmayoga practice. I also agree on the GTCs. Karmayoga is a common practice in buddhist centers and offers a good opportunity to commit oneself for the benefit of the practice group and to practice mindfulness in daily activities.